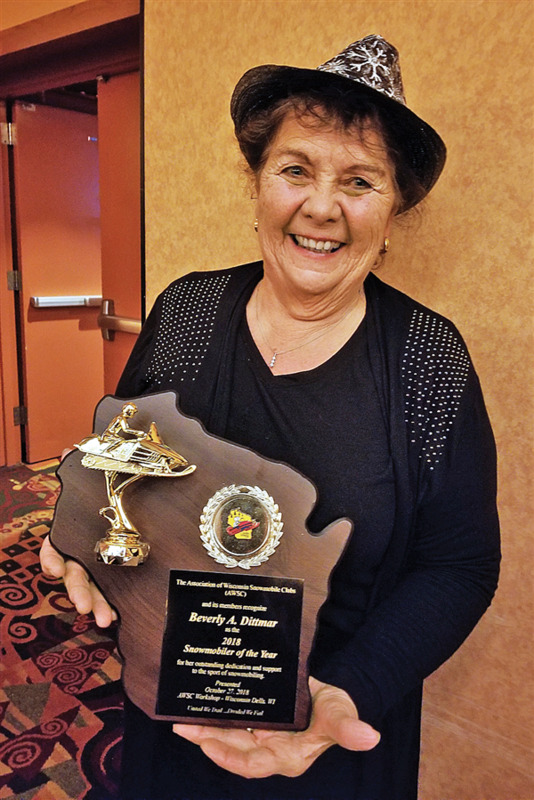 Beverly Dittmar of Sugar Camp was chosen Snowmobiler of the Year by the Association of Wisconsin Snowmobile Clubs (AWSC) at its annual workshop meeting in Wisconsin Dells. Based in DeForest, the AWSC is the legislative voice of more than 600 snowmobile clubs in the state. Dittmar, 81 and still trail riding each winter, has been involved in snowmobiling for more than 40 years. She is currently a member of the St. Germain Bo-Boen, Sno-Eagles and Sugar Camp snowmobile clubs. She is the chairwoman of the Governor’s Snowmobile Recreation Council, a founding member and director of Women on Snow, and a certified snowmobile safety instructor. Before moving to the Eagle River area on a full-time basis 22 years ago, Dittmar worked for the Department of Natural Resources as the Marathon County trails coordinator, was the Marathon County Snowmobile Alliance secretary and was the second person to serve as the AWSC secretary. Dittmar said she was thrilled to receive the award. Dittmar has been involved in snowmobiling since the early 1970s. “I can say I’ve seen the program come from when we pulled bed springs to smooth the trails to using high-class equipment that now is computerized and equipped with time sheets to record the hours for the groomers,” she said. While she worked in Marathon County, Dittmar said she and her late husband David built a place in Sugar Camp near Pitlik’s Sand Beach Resort in the early 1970s. They moved here full time 22 years ago, though her husband died four years ago. She is still heavily involved in the Governor’s council, Women on Snow, local snowmobile clubs and snowmobile safety. Dittmar also still enjoys hitting the trails. Dittmar said she enjoys the sport because it can involve the entire family and she likes the winter scenery. “The fact is, it is not only a family sport, it is for men, women, and children, and I think the joy of being in the outdoors in the most magnificent country that you have in Wisconsin and into Michigan. I think Wisconsin has it all. We have such a variety of terrain for snowmobiling,” said Dittmar. Dittmar said it’s the clubs and volunteers the keep the sport going. “That is what is so impressive about it. Clubs put so much into it. We now have magnificently groomed trails. It’s nothing to put on 200 miles in a day,” she said. Dittmar said she has worked with a lot of great people in the sport and is proud to have received the Snowmobiler of the Year award. “It certainly was a nice honor. I have the honor of being in the association, a long time on the Governor’s Council and as Marathon County snowmobile coordinator. I worked with a lot of great people through snowmobiling. There are so many people I’ve known for so many years and worked with in the program,” said Dittmar.